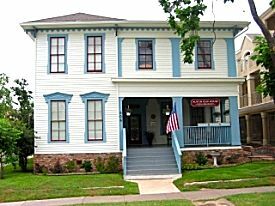 Centrally located and in a beautifully restored 1880 Prairie Style Victorian, the Austin Folk House is sure to provide a memorable stay during your next business or pleasure trip to Austin. All nine guestrooms have either queen or king sized beds, private baths, private phone lines with voice mail, cable TV and VCR, robes and fine toiletries, and many other fine amenities. Also included with your room rate is a wonderful Texas sized gourmet breakfast, afternoon sweets and tea, and evening complimentary wine. The house itself is beautifully decorated with antiques and a large collection of folk art.